One of the exercises at the conference split participants into 35 teams. Each team had five hours to work together to solve a problem for a hypothetical company, a concept put in practice in Stonehill classrooms. Teams then had to pitch their solution to a panel of judges the next morning. 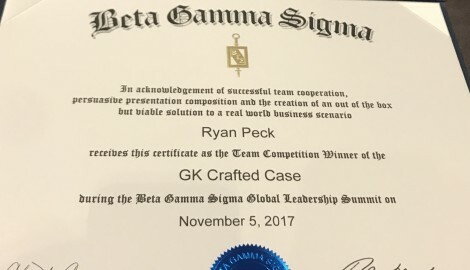 Although originally worried his skills wouldn’t match up with those of other students, Peck found himself emerging as a team leader. Beta Gamma Sigma, or ΒΓΣ was founded in 1913 at the University of Wisconsin. 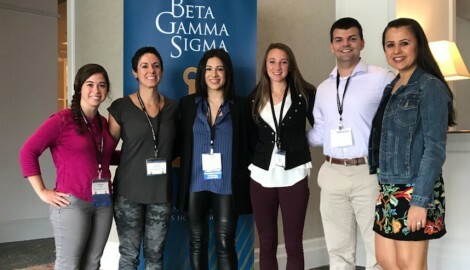 It has more than 800,000 members in more than 540 collegiate chapters in business schools accredited by the Association to Advance Collegiate Schools of Business (AACSB) International. Stonehill is among the 6 percent of business programs in the world to have earned the accreditation. In August, Stonehill’s chapter, inducting the top 10 percent of students in the Meehan School of Business, was awarded the Honor Roll Scholarship after the chapter received a High Honors ranking. The scholarship pays for the registration, cost of lodging, program materials and most meals for one student to attend the summit. Virginia Cortijo, an associate professor of accounting and Beta Gamma Sigma advisor, encouraged Peck to take advantage of this opportunity and he was selected to be the first student from Stonehill to attend. The conference hosted students from business schools across the globe. Peck met students from places such as Ohio, Hawaii, Turkey and Hungary. 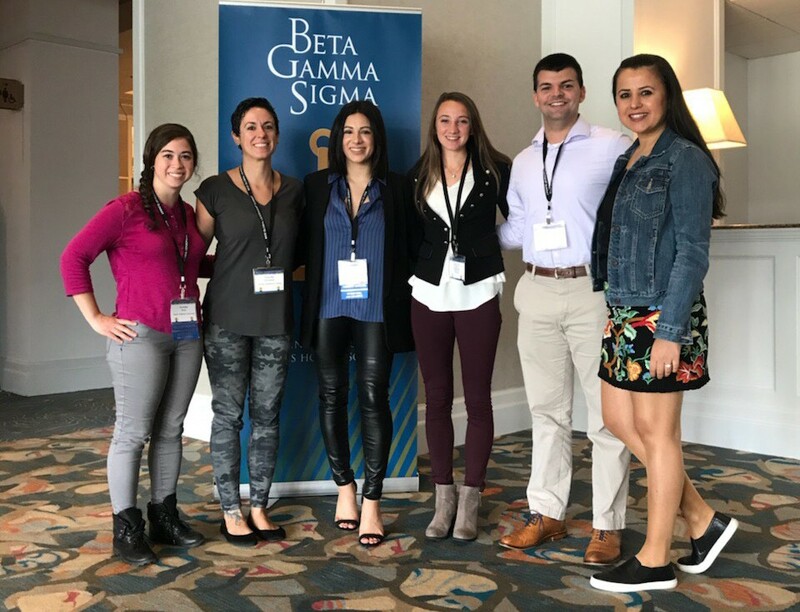 They spent time at the summit networking and attending presentations meant to help them become better business professionals. While at the conference, Peck was reassured by how well Stonehill has prepared him to enter into the workforce. 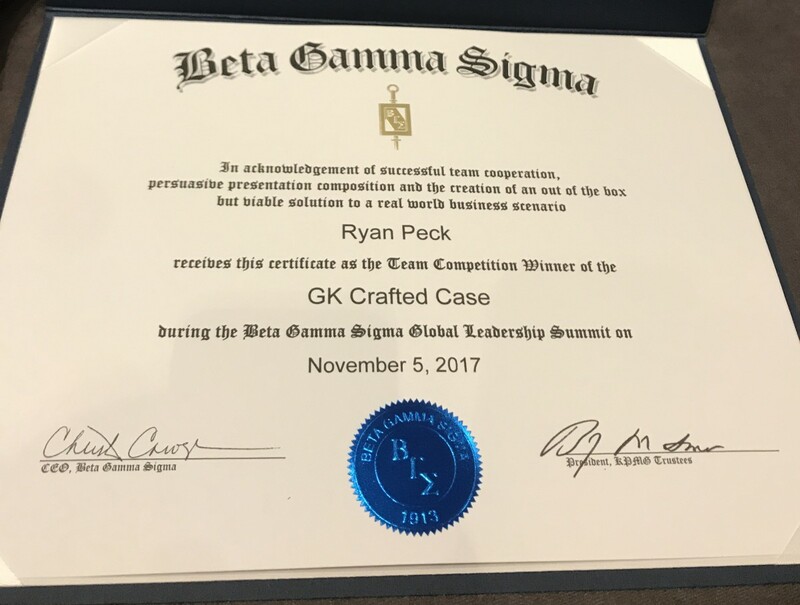 Although originally uneasy about traveling alone, rooming with a complete stranger and working among the top tier of business students, Peck is grateful he stepped outside his comfort zone. He hopes he can inspire other Stonehill students to follow in his footsteps. When Peck graduates in May, he will continue his education and get his master’s in accountancy from Northeastern University. After finishing his MSA in December 2018, he plans to take the CPA exam and begin working full time with PricewaterhouseCoopers as an assurance associate in January 2019.